In 2015, McGill University PhD student Paul Scholz found that a previously detected FRB actually repeated. It left astronomers scratching their heads over an already bizarre cosmic puzzle. 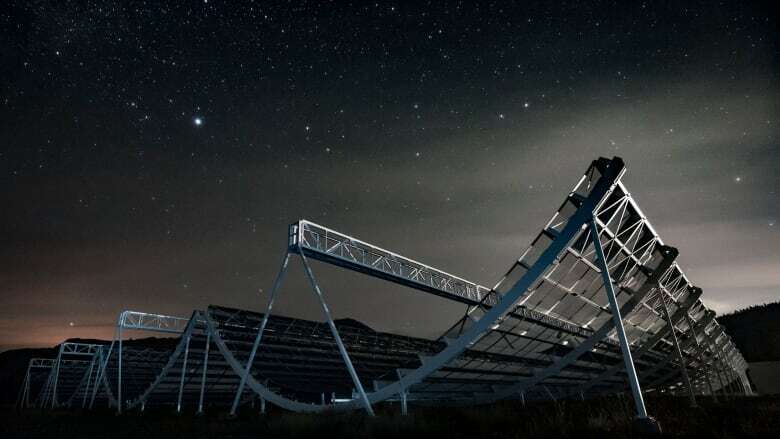 "We certainly hoped that the CHIME telescope was going to be able to discover a lot of fast radio bursts," said Ingrid Stairs, a member of the CHIME team and an astrophysicist at the University of British Columbia. "And we had the good luck to find 13 of these things in the pre-commissioning phase." The pre-commissioning phase meant that the telescope wasn't running at its fullest capacity. In fact, it was only looking at one-quarter of the sky it is able to observe. 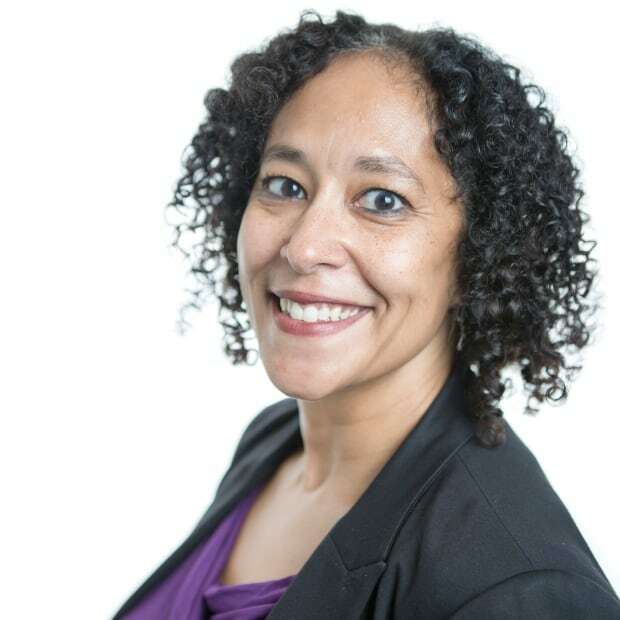 For Kendrick Smith, a cosmologist at the Perimeter Institute for Theoretical Physics in Waterloo, Ont., who worked on the software making the detection, FRBs represent a unique challenge. "FRBs were an unexpected mystery. There aren't so many qualitative mysteries in astrophysics," Smith said. "So explaining their nature has become one of the biggest unsolved problems in astrophysics in the last few years." FRBs are similar to pulsars, small and rapidly rotating, dense stars that emit signals as they rotate, sort of like a cosmic lighthouse. However, these pulsars have been found in our galaxy. For FRBs to be detected from other galaxies means the signal has to be trillions of times brighter than a pulsar. "That's one followed by 12 zeros. That's huge," said Shriharsh Tendulka, an astronomer at McGill University and a member of the CHIME team. "We have no idea how to make something that bright." 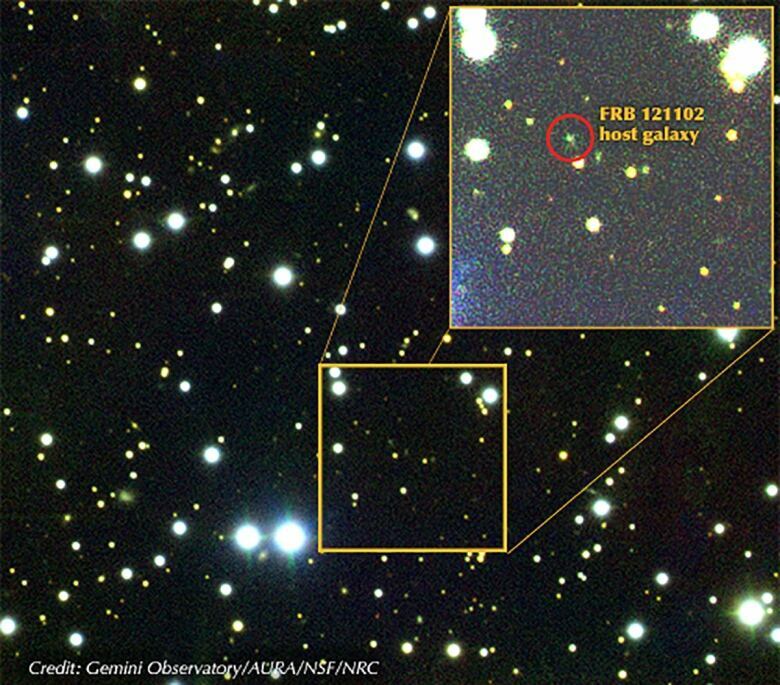 Repeating FRBs may be a rare finding, but they're even stranger than their single counterparts. In regular FRBs, they emit a single spike. But in the two repeaters, astronomers found different spikes coming in at slightly different frequencies and times. "We don't see these kinds of structures from other fast radio bursts that are in a single burst," said Tendulkar. "So that is exciting. It might point to a difference between their internal mechanisms." These 13 FRBs, which include the repeater, were detected on a much lower frequency than had been detected before. Most FRBs found are at frequencies near 1400 megahertz (MHz). But these were found in the band between 400 and 800 MHz. "The CHIME frequency band sits in this gap where we didn't know anything about, so that's fantastic," Tendulkar said. "It gives us a lot more information." Stairs credits the discoveries to an "amazing team" of post-doctoral researchers and is confident more findings are on the horizon. "CHIME is looking at the whole northern sky every day so there's plenty of possibilities to find more of these things," she said. "The fact that we found a second one just like that in a way implies that there could be lots more out there." As for the mystery behind the FRBs — and especially the repeating ones — the Canadian team hopes that with CHIME now at full capacity, more of these repeaters will reveal themselves. "CHIME is still in its early days and most of the exciting results are yet to come," Smith said.